Briefly: I'd love to see larger-scale competitive play. I had one experience of a full air superiority server with every player being on comms and an experienced dogfighter. It. Was. Amazing. I dream of a combined-arms equivalent. I think BF1 would be a good candidate for such. Unlike ARMA it's still fast paced yet the ability to suppress works well especially against good players (unlike some that just rather run out in the open and die) In BF4 if and enemy was >50m away I stood a fair chance of bunny hopping away in full view, not so much here. Whats makes 32s hard is numbers. If you have a 32s team, you need ALOT more then 32 players. In my experience to have a effective 32s team roster that's playing every week, you need at A BARE MIN 64. At that point you likely get by but probably be doing a lot of shuffling around last min before game time and praying you can fill all the key vehicle roles. 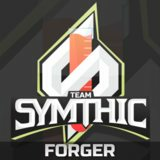 Team Sym 10s active roster was typically right around ~20-25 players. If you include inactive players, that number gets much bigger. I've seen team survive with smaller numbers in 10s but it servery effects them in the long run. When it comes down to it...really the case of 32s is all about sustainability. I know not many people have had to, but damn is it tough to gather and keep a roster of ~80+ people together and showing up every week. Hell never mind every week. Team Sym used to do 32s once every month or two, but eventually no one other then us could put together a proper, trained, competent 32 man team at all. Then eventually no one could even put together any 32 man team. i think large teams comp should be limited to a max of 40p games, 32 obviously being the ideal, 64 for as much as i'd wish, it's just too much an insane number, that's pretty much most of the symthic community platoon and afaik the largest portion of teamsym if not the entirey of it or more. My simple response to your blatant attempt to derail is this: that was my philosophy for BF4's gameplay and mechanics, it has since evolved with BF1's gameplay and mechanics. I still stand by what I suggested back then, but it isn't applicable now. The past is the past and in no way representative of the present. If I am understanding correctly, the purpose of the thread is to create a "movement" to influence the player base to actually engage in teamwork. Would that be a correct assessment? Kinda, it won't change the player base but by playing efficiently as a squad we're likely to attract players with the similar mindsets, you'd never the change the pro sniper with his KD being his self identity. Say first have a squad, and let it snowball. Lol, I've been trying another approach on Reddit BF1 with a call out for players that are serving or ex-servicemen. Regardless of whatever corps any grunt or marine would know the concepts instinctively. I had a game the other day with 2 ex-marines. Ended up being a 9 hr sessions, none of us were good in a gamer aspect but moving, firing and stop dropping felt so fluid with those guys. Which is precisely why we need competitive players playing 32v32 as a model of how to balance the game, instead of 10v10, 8v8, or similar. Competitive/play-to-win players excel at finding optimal tactics/strategies, including any and all exploits and other unintended "features" in the game, and making the most of them. And thus, competitive players are the best possible candidates for finding balance problems, bugs, and other problems/oversights. The best part is you (by which I mean devs) don't even have to get direct input or opinions from them if you don't want, because they're simply making these things evident through playing, which can then be fixed. Honestly, Battlefield is far better suited gameplay-wise to large playercount organized play than to smaller formats. Other first person shooters are designed from the ground up for small formats, Battlefield is designed with large maps, large teams, and combined arms in mind. The limiting factor, however, as Element says, is organization. It's not just harder to organize 32s than 5s, it actually starts to involve a fair quantity of what amounts to unpaid work from one or more people. Lot's of players are interested in just showing up at match or scrim time and playing Battlefield, and if you're a group of 5 people playing another group of 5 everyone can almost do just that. That's no longer the case when you start upping the number of people involved, at least if you're interested in actually seeing more coordination than in a random public server. It's not undoable. We've done it before. It was super satisfying, and I, like many others, was willing to put in a little unpaid work to make it happen, because it was worth it. With the lack of support we got for this sort of thing from the developers in BF3-BF4 and the overall population issues BF4 had with it's rocky launch we couldn't keep doing it in BF4 because there weren't any organizations that could field complete teams. Unfortunately, things have gotten much worse for the possibility of 32s in BF1. Even with all it's faults, Battlelog did help organizations of players form and grow, and now that is gone. You need fairly massive communities to draw enough interested and active players from to actually form 32s teams. Then there is the lack of passworded servers, which essentially makes the rest of this entirely moot because you can't have any sort of organized play if any random dude can join the server you're trying to use, take a slot away from one of your players, and drive your tank off a cliff. I'd like to play 32v32s again. It's just as cool as it sounds, if you have some people willing to put in the effort to do it right. It's all up to the developer though, it wouldn't take much for them to make it at least possible again, and it wouldn't take much more to actually support it in a basic way, but it doesn't seem to have been on the radar of the higher ups at DICE/EA, at least not yet.